Day 31: What a day, what a day. We woke up to pouring rain, which should have been the first sign that the day wouldn’t be easy. 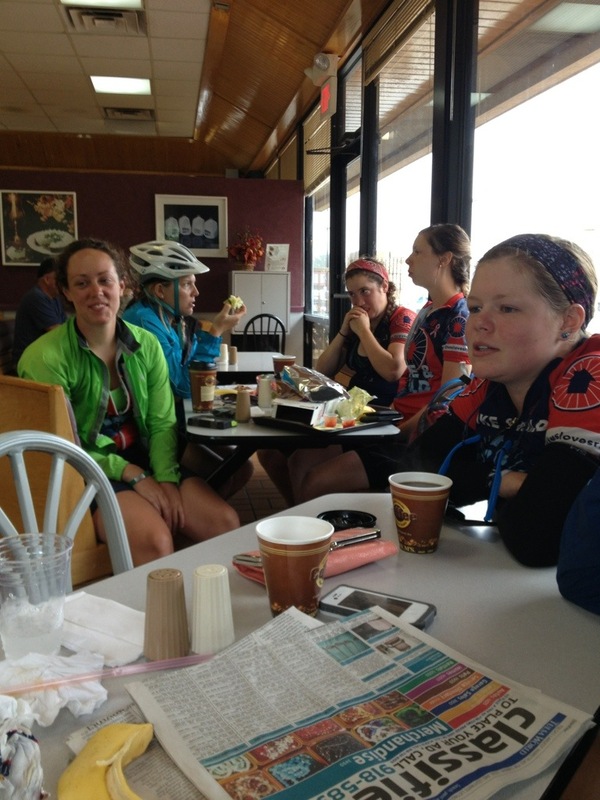 We got coffee at our favorite Daylight Donuts in Grove, OK to try to wait out the storm! Conor also took the time to stretch right in the entrance way to Daylight Donuts. My radar told me that the rain would pass fairly soon. I headed out with Amelia and Sarah. I much prefer small groups of 3-4 riders than larger groups of 5 or more. I feel safer because it’s easier for cars to pass, especially when we’d been warned earlier that we’d be on roads with little to no shoulder. It began to rain, but the beginning of the day wasn’t terrible. The drizzle actually kept us cooler and allowed our skin to take a break from the sun that it sees too much of every day. But before we knew it, it was pouring. 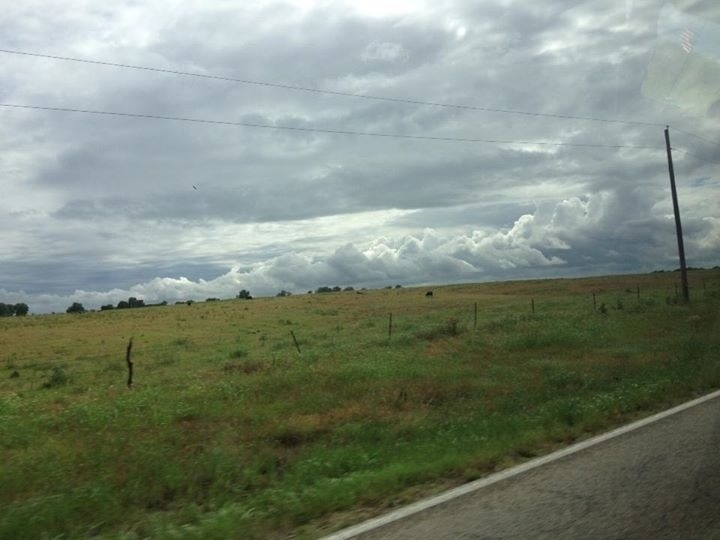 The thing about Oklahoma is that when it’s flat (believe it or not, it’s NOT all flat), you can see for miles ahead, and that goes for the weather patterns too. 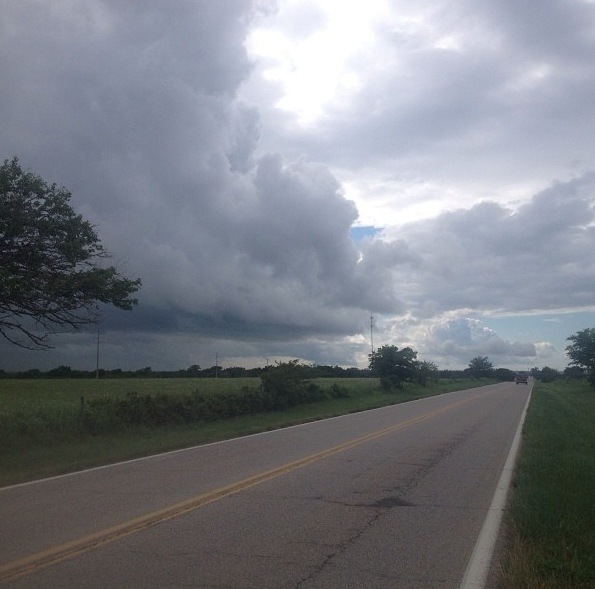 We could literally see giant dark clouds billowing up ahead in the direction we were headed. It was no shock when the torrential downpour ensued. The three of us sought shelter at a church for a little while before we found out on the GroupMe (an app that allows us all to communicate through what is essentially one giant text message) that a bunch of riders had stopped at a Braum’s fast food restaurant about a mile up the road. We decided to troop through the rain for just one more mile to catch up to our fellow riders. We must have been there for two hours trying to wait out the storm. Upon checking the radar again, Gerk went into meteorologist mode and gave us the forecast: “GUYS. The state of Oklahoma is flooding right now.” We were screwed. 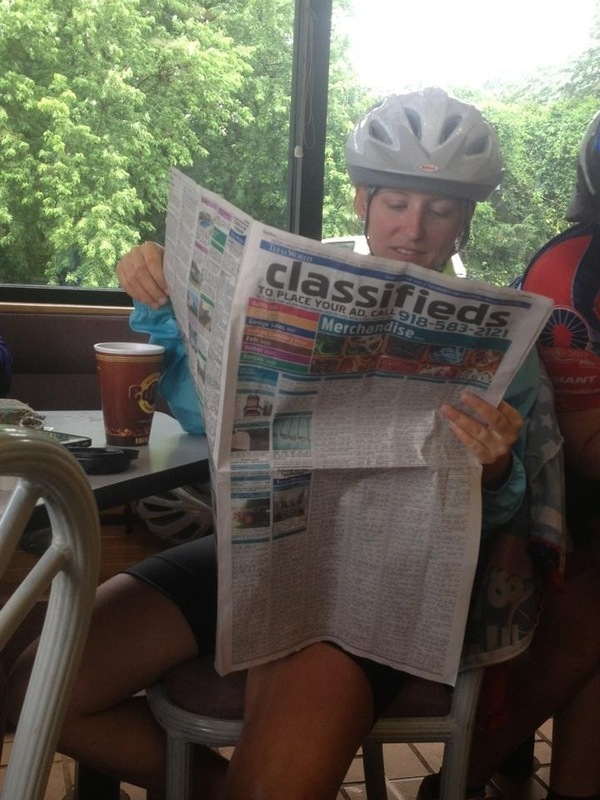 Lo later found a newspaper and decided to peruse the Classifieds. If later asked by the leaders why we never made it to Bartlesville, we’d say “Oh, because Lo got a job”. We even looked through real estate options in Vinita, OK to accommodate all of us. Finally, the rain let up. Sweep (Scott and Conor that day) had actually gotten ahead of us, but only by about a mile or two. Scott had gotten a flat tire a ways back, and while trying to pump it back up, his incredible strength had caused him to break the pump. 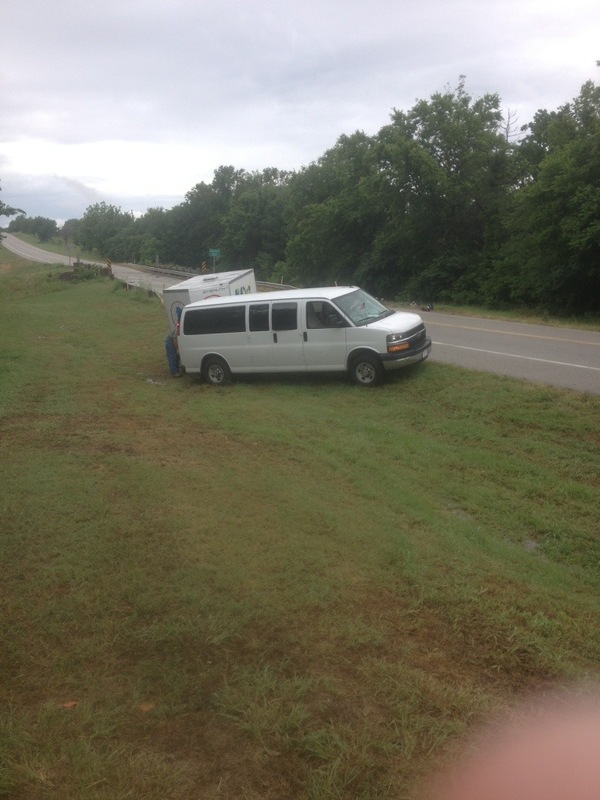 They had to hitch hike into Vinita. I decided that I would bring him my pump to use for the day and Emerson, Marge, and Gerk would come with me. Just as we were grabbing our bikes to roll out, LoBro said “guys… I have a flat…”. Selfishly, I left her with the others to deal with that flat. I wanted to get going because it was 1:00pm and we were only 26 miles into our 74 mile ride. Ain’t no way we were making it there by 4:00pm. We stopped briefly to give Scott the pump and then proceeded onward. Unfortunately, the rain didn’t end for long and we continued to get drenched on. It wasn’t the safest road to be on during a downpour either. I made the executive decision to be the last rider and continuously check for cars approaching from behind. If I saw a big semi truck coming along, I would warn the girls to pull over and let it pass. We had no shoulder whatsoever and visibility was poor. I would wave my left arm around whenever there was a car back so I could be sure they’d see us. Our reflective triangles that we wear on our camebaks at all times definitely helps with visibility too, and we all had rear blinky lights. At one point, Gerk said to Emerson (key word is SAID, not sang) “Emerson, I wanna know… Have you ever seen the rain?”. Soon thereafter, we had to pull over because Marge’s contacts were giving her trouble after being pelted with raindrops. At one point, she called out “MY COWS!” and we had to tell her they were actually hay bales. We FINALLY made it to lunch. It was such a stressful stretch from Braum’s to lunch. I was ready to be there and hang our for a bit. I was even ready to hop in the van and call it quits for the day. I knew I could physically finish the ride with ease, but the weather conditions were making me very nervous. We could overhear leader Steven talking on the phone to the group we left at Braum’s: Lo, LoBro, Sarah, and Amelia. Apparently, LoBro had gotten not one but FOUR flats. 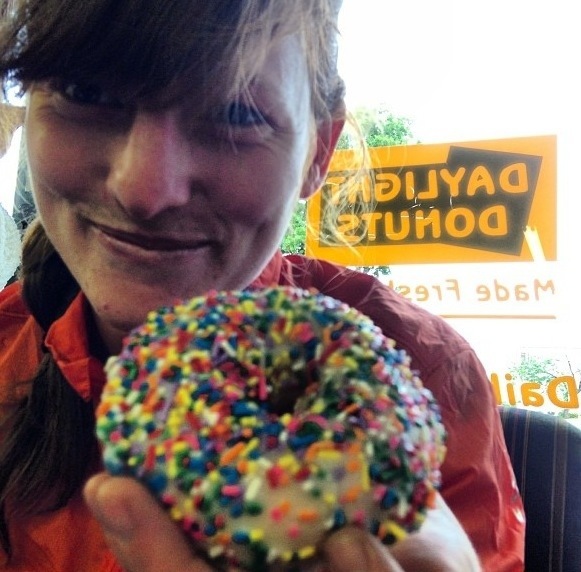 At the fourth flat, Lo said she almost fell off her bike laughing from pure delirium at the day and the circumstances they were facing. LoBro had completely blown out her tire, and after a miscommunication with sweep, who always carries an extra tire for such occurrences, they were already ahead of them and on their way to lunch. Steven had to go pick up the four girls and van them for the day because they were too far behind to make it to the host site. 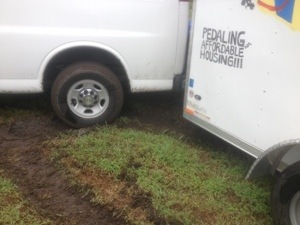 As he was leaving, Steven got the van stuck in the mud. What a cluster-“you-know-what”. We waited around for him to get some help. A nice man from Texas pulled over to help, as did a police officer. Eventually we got someone to pull the van and trailer out with their truck. Sweep pulled up to the situation and I’m sure it added to the overall hilarity of their day. And then we were off. I remember seeing that it was 3:50 and that we still had 30 miles to go. No bueno. We stayed positive and kept going. Even though I was slightly bitter about not being vanned because I was so incredibly sick of riding in the rain, I knew I’d be happy that we finished the day once we got to the church. Post-lunch ride was better, and by that I mean it was dryer. I was beyond ready to get to the host site and settle in for a few nights, as we had 2 build days ahead of us in Bartlesville, OK. This entry was posted in On the road! on June 19, 2013 by murphykg. You gotta take the good with the bad, I guess.Rain or shine. But, remember, the farther west you go, the margaritas keep getting better! And San Diego will have the BEST! Whether you spend time in the downtown area, Old Twon San Diego, the Gaslamp District, or wherever, each bar tries to do outdo each other. ……. it’s awesome. You’re doing great so far, and NOR is rooting for you!